Pro-Tip: Take your first look at the new season of Queer Eye launching exclusively on Netflix February 7, 2018. A brand New Fab Five: Food & Wine, Interior Design, Culture, Grooming and Fashion. Watch the Trailer NOW! It’s been fifteen years since the Emmy Award-winning series Queer Eye for the Straight Guy revolutionized reality television. The series returns to Netflix and is going global, introducing audiences around the world to a modern aesthetic, diverse perspective and a brand new Fab Five: Antoni Porowski (Food & Wine),Bobby Berk (Interior Design), Karamo Brown (Culture), Jonathan Van Ness (Grooming) and Tan France (Fashion). This season Queer Eye trades its original New York setting for communities in and around Atlanta, Georgia. Our new Fab Five will forge relationships with men and women from a wide array of backgrounds and beliefs often contrary to their own, touching on everything from LGBTQ rights and social commentary to how to make the best farm-to-table guacamole and more! 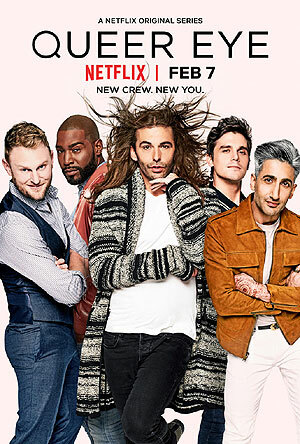 Queer Eye for the Straight Guy creator David Collins (Scout Productions) serves as executive producer for the new series, along with producing partners Michael Williams and Rob Eric. David Eilenberg also serves as an executive producer in association with ITV Entertainment. Queer Eye launches globally on Netflix February 7, 2018.